Some of you might have had a preview of this new coffee at our shop recently, Los Placeres. This single origin, single varietal fresh crop coffee comes from our latest direct trade import from Nicaragua. Its name means ‘the pleasures’ in Spanish. This is definitely an apt name for its cup profile, one which got us to discover the simple pleasures of an everyday cup. How we came about this coffee traces back to our travels last year which started with New York, a city that meant a great deal to us for the inspirations behind Nylon. While coffee crawling in the Big Apple city, we found out about a coffee event at a then new restaurant, Vandaag. It was a free tasting event with well-known names from Scandinavia, including Casper Rasmussen of Coffee Collective (Denmark), Tim Wendelboe himself (Norway, 2005 WBC champ), Tim Varney (Roaster @timwendelboe) and Stephen Morrissey (Ecco Cafe/Intelligentsia). 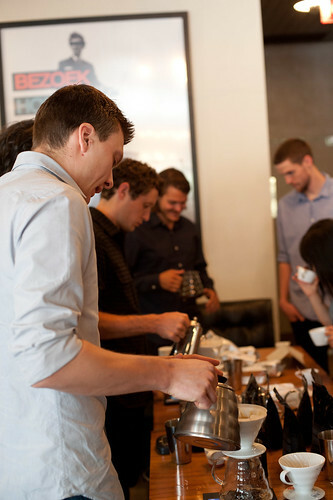 An opportunity to taste coffee from the Nordic roasters was like an early X'mas gift for us. The experience was priceless. We had the most amazing v60 pourovers from Tim Wendelboe, Coffee Collective and Ecco. Besides having a chance to connect with these roasters and world-class baristas, we also got to speak to Steve Mierisch, who works for Intelligentsia. Steve is a member of the Mierisch family, who has been farming in Nicaragua for over 100 years. We chatted with Steve about our upcoming trip to Central America, and he was so kind to offer to connect us with his sister, Eleane, who might be able to show us around their coffee farms if our schedule permits. Unfortunately, we did not get to visit the Mierisch farms, but we did get a chance to visit a small coffee farm in Matagalpa to learn more about the local farming and processing operations through a small cooperative, CECOSEMAC. Fast forward to November, we traveled to Seoul to attend the International Cafe Show, where coincidentally, we met Erwin Mierisch, brother of Steve, at the trade show! We were thrilled to meet the farmer himself and shared with him our encounter with Steve & the beautiful coffees we had from their farms, Finca Limoncillo and Finca La Escondida. Our brief run-up with Erwin helped to lay the path towards the start of a direct relationship with the producer. We were initially worried that given the volume constraints we have as a micro-roaster, they might not be able to work with us. However, our worries were unwarranted as the Mierisch family are truly supportive of working directly with roasters. So despite our “mini” size, they sent us a bunch of samples that cupped very well. We selected 3 farms of different varietals, each with characteristics that we thought are interesting to share with our customers. One of which was Los Placeres, which blew us away the first time we cupped this coffee, for the explosion of flavours. The bean varietal, Pacamara, is a hybrid between 2 varietals - Pacas and Maragogype. This giant bean type is quite a nut case to crack when we test roasted the new arrivals with different roast profiles. We finally pinned down a roast profile which brought out the intricate citrus & fruity notes ending off with a chocolate finish. We love it being super clean and balanced, with hints of honey and caramel as the cup cool. We think this is a very pleasing “everyday” cup of brew and the pleasant body will attract many more fans. We have started brewing Los Placeres in the shop and it is definitely becoming a crowd pleaser. It works particularly well on the Kalita and Clever dripper and is recommended as a filtered coffee only.